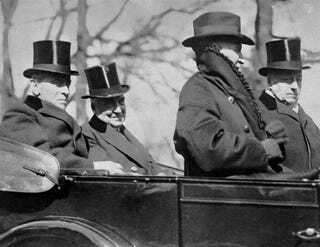 Warren G. Harding was the first president to ride to his inauguration in a car? Here he shares a Packard with outgoing president Woodrow Wilson. Harding was a big fan of “normalcy” whatever that means. He didn’t look too happy for somebody who was about to become the most important man in the world. Maybe he was already thinking about that teapot dome thing. He may not have been a classy dude, but he had a classy car. Extra trivia: Wilson was the only president we’ve had to have earned a Ph.D.